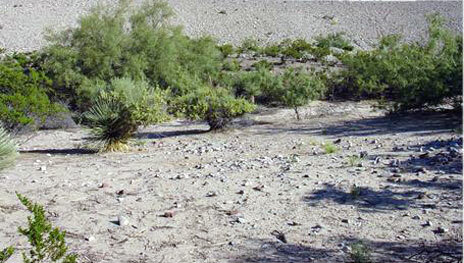 Like many regions of the Chihuahuan Desert annual rain fall is unpredictable and variable. There are good years and there are bad years, and even when it does rain, it is not evenly distributed across the landscape. This pattern of unpredictability was more than likely true for inhabitants in the region over many millennia. One of the most serious droughts in this region occurred about 8,000 years ago. This drought restricted the availability of resources across the region. Many archaeologists suggest that the region was only sporadically visited during this time. Cooler and wetter conditions returned by about 6,000 years ago (ca. 4000 b.c.). Modern conditions were in place in the borderland region by about 4,000 years ago (ca. 2000 b.c.). Middle Archaic peoples took advantage of the new resource abundance by moving back into the borderlands by about 4000 b.c. Eventually, these people occupied Keystone from ca. 2800 to 1800 b.c. Keystone is not the only Middle Archaic campsite in the Rio Grande Valley, but no other site in the borderland region contains so many structures, over 20 in total!